Since I can't seem to locate the original thread for this issue--let's start another. Very interesting info--thanks to Menace for researching this. That thread is gone? There were some good things there. Oh, man. Yes, it would be a shame to lose all that info. Hopefully it is just a forum data glitch and it will turn up soon. Mods. Could you please restore the missing Obama Birth Certificate thread? It was probably the best of its kind on the internet. It was an INCREDIBLE collection of information on the subject. My first post on the thread mentioned ArnoldExposed.com. That's an Alex Jones site. Jones seems terrified that an Austrian MIGHT become president, but meanwhile, we have a Kenyan who IS president. The thread needs to be restored. Okay, when the media shills start saying it's a legitimate question--I REALLY wonder just what team Obama have up their sleeve, perhaps a forged long form will be produced? WASHINGTON â€“ Sean Hannity today defended Sarah Palin's recent comments about Barack Obama's constitutional eligibility for the presidency and WND's pursuit of the story. He said the question about his original, long-form birth certificate has still not been answered. "What was so wrong in saying that, 'Can we see your birth certificate?' ... We were told early on that, in fact, somebody else had looked at it and confirmed that it was legitimate. So, I mean, what was wrong with people saying, 'Wait a minute. You know what? In light of the fact of where your, your father came from, et cetera, uh, let's just make sure that this is a legitimate birth certificate'? ... It was not asked by the mainstream media. It was asked by places like WorldNetDaily, who, I think, were just doing due diligence considering it's a constitutional mandate. ... I think a lot of people were just afraid to ask the question." Last week, Palin, the former Alaska governor and vice-presidential candidate in 2008, said the public is "rightfully" asking questions about Obama's eligibility. "Would you make the birth certificate an issue if you ran?" Palin was asked in an interview on the Rusty Humphries national radio show. "I think the public rightfully is still making it an issue. I don't have a problem with that. I don't know if I would have to bother to make it an issue, because I think that members of the electorate still want answers," she replied. Humphries asked: "Do you think it's a fair question to be looking at?" "I think it's a fair question, just like I think past association and past voting records â€“ all of that is fair game," Palin said. "The McCain-Palin campaign didn't do a good enough job in that area." Palin said it was legitimate to question Obama's eligibility, referring to "the weird conspiracy theory freaky thing that people talk about that Trig isn't my real son â€“ 'You need to produce his birth certificate, you need to prove that he's your kid,' which we have done. After Humphries' interview, however, Palin posted a message on her Facebook page under the banner "Stupid conspiracies," clarifying that she has not and will not press the issue of the president's eligibility. "Voters have every right to ask candidates for information if they so choose. I've pointed out that it was seemingly fair game during the 2008 election for many on the left to badger my doctor and lawyer for proof that Trig is in fact my child. Conspiracy-minded reporters and voters had a right to ask ... which they have repeatedly," she wrote. "But at no point â€“ not during the campaign, and not during recent interviews â€“ have I asked the president to produce his birth certificate or suggested that he was not born in the United States." Donofrio on IPPT v. Chrysler: TARP Still in Play with Dealers. Thinking the Legally "Unthinkable" in the KSM Trial If Khalid Shaikh Mohammed is clever he will turn his trial into an Obama birth certificate circus? As of this update on December 16, 2009, the information â€œleakedâ€� by Pettway to WVLT appears to be false, as the Monroe County Grand Jury has yet to issue any such findings. In fact, Fitzpatrick states that he has had no further contact of any kind from the court. Calling it â€˜leakedâ€™ information suggest, contrary to the facts, that Pettway disclosed information that should have remained sealed. Of course, that appears to be flawed as the Monroe County Grand Jury historically releases its report on Tuesdays. The Hawaii Department of Health has published a dossier of excuses to rebuff public inquiry into the vital records of Barack Hussein Obama, which the Office of Health Status Monitoring alleges to maintain. Last night Attorney Leo Donofrio filed an Omnibus Motion to Reconsider in the case RE: in Chrysler LLC et al., in the name of Attorney Stephen Pidgeon and himself, and on behalf of more than 20 Chrysler Dealerships, seeking to recover monetary compensation for the loss of their franchises and contractual rights with Chrysler. The case involves the disputed bankruptcy proceedings of Chrysler automotive corporation, known formally as Chrysler LLC. The many cases regarding the dissolution and sale of Chrysler are being heard before the Honorable Robert J. Gonzalez, United States Bankruptcy Judge for the Federal Court, Southern District of New York. Is Obama's real name â€œSteve Dunham"? In the confluence of Birther legal talent that took place yesterday in a Florida court room, regarding forgery in the real estate redemption case, Rivernider v. US Bank, Iâ€™m afraid the promised written report will have to wait until two Politijab court observers pick themselves up off the floor. So says Ed Hale, who will be interviewing her on Thursday night. This may explain the frenzy she has been in for the past few days, which did seem a bit different from the frenzy she is usually in. Dr. Orly Taitz, Esq. has heard from the California Bar Association and does not like it one bit. She is incapable of defending herself adequately, so sheâ€™s sprung for a professional attorney. Bar investigations are confidential, so we may never know what really happens, and thatâ€™s a goddamned shame. But Ed Hale promises she will be talking about this very thing on his radio show this Thursday night. A McHenry County judge denied a Fox River Grove womanâ€™s request to present to a grand jury her claims that President Barack Obamaâ€™s citizenship amounts to widespread voter fraud. Sharon Ann Meroni, founder of Patriotâ€™s Heart Media Network, and 20 unnamed network members asked Judge Sharon Prather to appoint Meroni an investigator. As an investigator, Meroni wanted to compel testimony and present evidence before the grand jury about the alleged voter fraud. But Prather told her this morning that there was no legal basis to allow such an appointment. She also said Meroni had failed to include any facts in her court filings to support her request last month. â€œThere is no legal basis for me to do what you are asking me to do,â€� Prather said, after Meroni questioned her decision. Prather said the Stateâ€™s Attorneyâ€™s Office is vested with the authority to decide what cases to prosecute. In the Third District US Court of Appeals for Eastern Pennsylvania, Philip Berg has made some strong charges against Dr. Orly Taitz, Esq, accusing her of practicing law without a license there. Yesterday, Attorney Mario Apuzzo filed the opening brief on behalf of the Plaintiffs in Kerchner et al. vs. Obama & Congress, before the 3rd Circuit Court of Appeals in Philadelphia. Radio Daze: Orly on Ed Hales new show, Plains Radio back on the air. Orly Taitz May Run For State Office, what is the odds that she win? â€œDo you believe that Barack Obama is a U.S. citizen? Gods army is real..join up..
"Resistance to tyrants is obedience to God"
found this thread on point. The matter of "birth certificate" seems to be a polarizing (left/right) issue. Most of the Lib's at my college say it is a right wing, nut job, conspiracy invention. They never look at any of the evidence they are given. Hannity embracing the issue only further polarizes the issue as being "right wing". Be very careful of who your friends are(guilt by association). Thanks, but not the missing thread. Apparently it was deleted by a Global Mod--wanted to get rid of the infighting posts. While political momentum is building within the Democratic Party from coast to coast to make the issue of Obamaâ€™s claims to be born in Hawaii a litmus test for its political opponents in the 2010 general elections for Congress, a key component in such a strategy has been undermined by the Hawaii Attorney Generalâ€™s Office. The stunning admission was made in an email sent to the Editor of this paper yesterday evening. The implications of this denial are catastrophic for the Democratic strategy. The Hawaii Attorney Generalâ€™s office has the duty to prosecute the laws of the State. Mark J. Bennett, the current Attorney General, was appointed to the office by Governor Lingle on Jan. 3, 2003. He is a former Assistant U.S. Attorney General for Honolulu, and a graduate of Cornellâ€™s Law School. Bennett is the first Republican to hold the office in 40 years. In an attempt to corroborate the contents of Dr. Fukinoâ€™s statement and understand better the value of that testimony, I put the following two questions to Nagamine, as a member of the press. I am seeking some information in response to 2 questions I have. Please understand that your response(s) or non-response will be quoted by our paper. Q. 1: Does the Director of the Hawaii Department of Health have any statutory duty or authority to define the citizenship status of anyone whose vital record(s) are kept by that department? Q.2: According to the legal references employed by your office, what is the defition of a â€œnatural-born citizenâ€� of the United States of America? I put my question to the Deputy Attorney General to avoid putting the Attorney General in a situation of a conflict of interest, if he in fact, did, as Dr. Fukino claims, advise her regarding her July statement. It is such, because if Fukinoâ€™s declaration had legal weight of any kind, surely a response to my questions would have corroborated that without such a conflict-of-interest scenario. You only have a conflict if the Fukino claim would not be supported by a Nagamine response. In December, the Department of Health for the State of Hawaii issued its own dossier of excuses as to why they are also refusing to confirm, by documentation, the July Statement to Dr. Fukino. Tennessee Lt. Gov. Ron Ramsey today questioned the presidentâ€™s citizenship, offering further proof that the Republican leadership in the General Assembly is out of touch with real Tennesseans. â€œI donâ€™t know whether President Obama is a citizen of the United States or not,â€� Ramsey reportedly told the Nashville Republicanâ€™s First Tuesday Club after it was suggested that no one running for president be put on a Tennessee ballot unless proof of natural born citizenship is provided. Mr. Ramsey would rather pander to a far-right wing group of conspiracy theorists than govern in a pragmatic approach that most Tennesseans expect from their political leaders. Quite irrationally, the Democratic Party is now asserting an undocumented claim as political â€œtruthâ€� and doubt concerning the veracity of such an unsupported claim as a â€œconspiracy theory,â€� which indeed is more evidence of the Partyâ€™s withdrawal from a Main Street notion of reality. The Post & Email recently published a report explaining why the electronic image promoted by the Obama campaign of a Hawaiian Certification of Live Birth is in fact a crude forgery and has been recognized as such for nearly two years. In October, the Hawaii Attorney Generalâ€™s office also refused to take a public stand on what the term â€œnatural born citizenâ€� means, raising further doubt about the value of any counsel offered by the Attorney General to the Fukino statement. The Post & Email notes, furthermore, that the term â€œnatural-bornâ€� is more commonly the medical term for a natural birth; whereas â€œnatural bornâ€� is the constitutional term meaning born on U.S. Soil of two U.S. citizen parents. For Secretary of State (or Attorney General): Dr. Orly Taitz, Esq. (Lafayette Hill, PA â€“ 02/03/10) â€“ Philip J. Berg, Esquire, the first Attorney who filed suit against Barack H. Obama challenging Senator Obamaâ€™s lack of â€œqualificationsâ€� to serve as President of the United States announces â€œBirth Certificate March on Washingtonâ€� demanding Obama resign as President as he is â€œConstitutionally ineligibleâ€� to be President. Berg is requesting all citizens of the United States to email, fax or mail a â€œcopyâ€� of their Birth Certificate that will be presented to Obama demanding that Obama resign because he has failed to produce his long form [vault] Birth Certificate to show he is â€œConstitutionally eligibleâ€� to be President. Berg said, â€œThen, we will be preparing them to deliver to Obama demanding that he resign from the Office of President as he has not proven that he is â€œConstitutionally eligibleâ€� to be President and that Obama has not produced legal documents to show he legally changed his name from his â€˜adoptedâ€™ name of â€˜Barry Soetoroâ€™ from Indonesia. Berg continued, â€œI still have cases pending in the Federal Courts. Here is the full article--thanks for finding this. NASHVILLE â€” During WorldNetDaily Editor-in-Chief Joseph Farahâ€™s Friday night dinner speech, which spent around 10 of its forty minutes on questions about Barack Obamaâ€™s citizenship, Andrew Brietbart was among the conservatives in back of the room grumbling audibly about what he was hearing. After he introduced the eveningâ€™s closing entertainment â€” a film titled â€œGeneration Zeroâ€� â€” Breitbart walked outside to the convention hall. There, I heard Breitbart criticizing Farah, and briefly talked to him about it before I noticed that WorldNetDailyâ€™s Chelsea Schilling was already talking to him, holding up a voice recorder. I backed up to allow her to continue her interview, which consisted of questions on why Breitbart didnâ€™t think Obamaâ€™s citizenship was a legitimate issue. After a few minutes Breitbart ended the conversation and Schilling started interviewing Tea Partiers about the speech, finding a little less skepticism. (I found some Tea Partiers, like Rita Grace of Virginia, who said they didnâ€™t appreciate Farahâ€™s speech.) I spotted Farah and asked him if his speech had been approved by Tea Party Nation. I told Farah that his speech was getting negative attention already, and that Breitbart, whoâ€™d taken the stage after him, had criticized the â€œbirtherâ€� parts of the speech. Farah shook his head and walked over to Breitbart in what seemed like an attempt to debunk my question. At that point, Judson Phillips â€” who had spotted a very small crowd around us â€” walked into the fray and tried to simmer everyone down with a joke. That more or less ended the conversation â€” Farah moved on, and agreed to talk more about why he and WorldNetDaily continued to pursue stories on Obamaâ€™s citizenship. The citizenship issue had stuck around and taken off, he said, â€œbecause of us.â€� He ran stories asking questions about the issue â€” including stories that were quickly debunked â€” because the rest of the media wasnâ€™t asking the questions. Asked whether he thought his speech created any problems for Sarah Palin â€” prompting reporters to ask why she patronized a convention with rhetoric like this â€” Farah rejected the premise. An audio of the Farah-Breitbart dispute in MP3 format, right click to download. Orly Taitz (most likely a government agent provocateur ((Mossad perhaps?)) to discredit, trash, and crash the Birther Movement) was there too at the Tea Party Convention. NASHVILLE â€” The woman dubbed by the Orange County Register as â€œqueen of the birthersâ€� arrived at the National Tea Party Convention today and did what she always does: hustle around talking to reporters and trying to get media coverage. 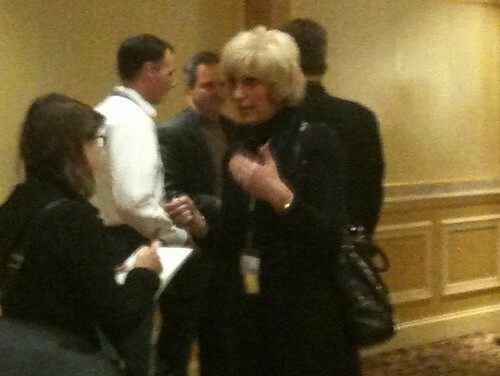 Pictured below: Taitz talking to Lydia DePillis of The New Republic.